Sara Varty, Head of Art at Willingham Primary School, gave a talk with her colleague David Morel at our Wonder Years conference on knowledge-led art curricula. Here, she writes down some of his thoughts on the topic for our blog, following on from David’s part 1, which you can read here. You can also see the PowerPoint they used on the day here. The three short requirements of the KS2 national curriculum for Art and Design could be seen either as liberating or terrifying. There is little there to use as a starting point for planning a rich and varied programme of art and, arguably, one result is that, in primary schools in particular, art projects have grown out of history and geography units rather than being planned as part of a considered and coherent school-wide curriculum seen as being of value in its own right. At Willingham, we are in the process of developing our curriculum in art. In the second of this two-part blog, following Dave Morel’s exposition of the ‘Why?’, I shall endeavour to explain how we have gone about this and to give some practical examples of how we have interleaved substantive knowledge of art history with the procedural knowledge of techniques that will enable the pupils to flourish as hands-on artists. We began with first principles: by asking what we hope for our pupils by the time they leave us. We want them to have a knowledge of art history, to be able to recognise key paintings and styles and to have a language in which to discuss and evaluate paintings unfamiliar to them. At the same time, we want them to be confident and creative young adults, to have developed skills across a range of media together with the independence and enthusiasm to make artwork of their own. It would be easy to see the two objectives as being in conflict but our aim is to create a programme and a method of teaching in which they support and complement each other. Our first step was to select a number of paintings for each key stage. With a limited number of artworks, it will inevitably be difficult to achieve a range of style, gender and geographical location and I do not underestimate the privilege and responsibility of making a choice. My hope is that, if we make meaningful links to other artists and movements and, at the same time, equip the children with a knowledge of stylistic elements and the technical vocabulary in which to frame their thoughts and observations, they will be able to use this in their appreciation of other art they see. Better to inspire by covering a few key paintings really well and in a way that can be remembered, than to teach the whole history of art superficially in such a way that the pupils recall little or nothing of it in years to come. We chose paintings that are iconic but that also have something to offer the children in terms of subject and technique. If you want the students to learn about Victorian art, they may well appreciate the beauty of some of Millais’ and Rossetti’s huge canvasses but are unlikely to be able to take much from them to use in their own artistic creations. However, our Year 1 and 2 pupils were immediately able to engage in their recent study of William Morris. 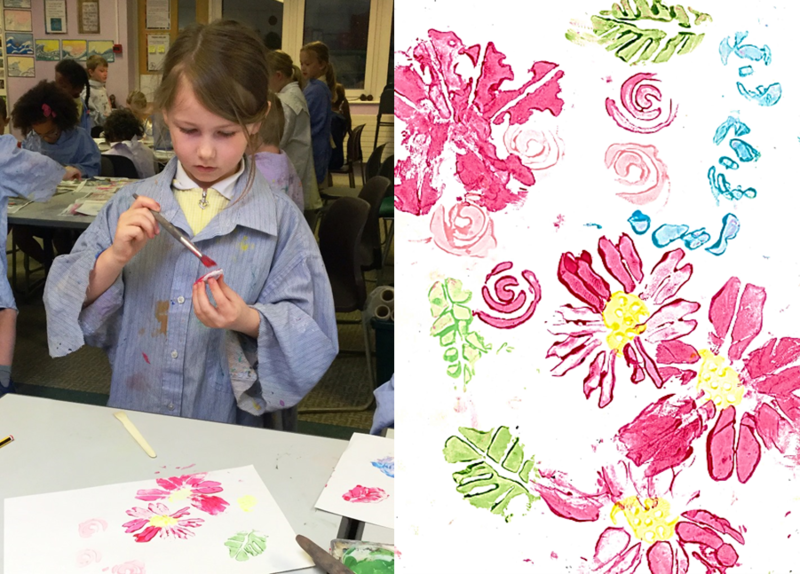 They learned the difference between painting and printing, made their own printing blocks from clay and experimented with other printing materials, using them to create fabric and wallpaper designs. We discussed the implications of printing more generally, touching on Gutenberg and Caxton, of the growth of mass production starting with the Industrial Revolution and Morris’ reaction to it. 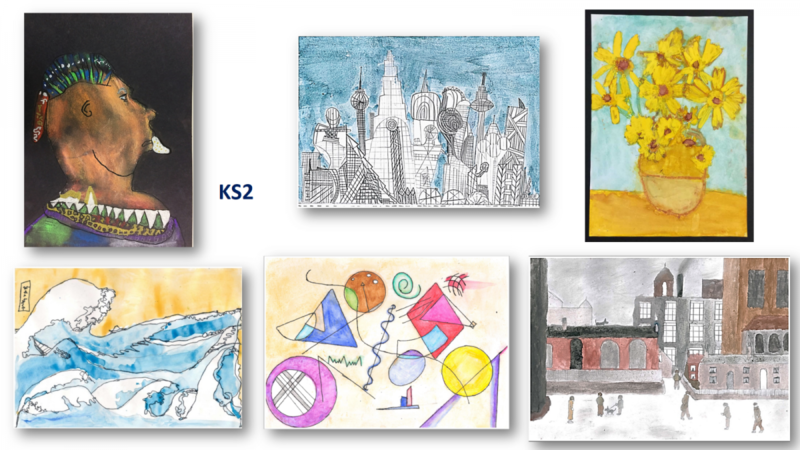 Having chosen key paintings, the next step is to generate rich learning objectives: pupils learn about the painting and its context and, at the same time, learn to use some technique or stylistic element that we have seen in it. In our unit on Hokusai’s Great Wave off Kanagawa, the Year 3/4 pupils were taught not only about the artist’s life, but about the series of paintings in which this one appears (we played a version of ‘Where’s Wally’ in which they had to spot Mount Fuji) and the tradition of Japanese wave paintings. We looked at contemporary photographs of Japan, considered the essential place of the sea in the life of a fisherman dependent on his catch, and looked at the influence of Japanese prints on Impressionism: there is an early print of the Great Wave at Monet’s house at Giverny, it was praised by van Gogh and inspired Debussy’s La Mer. The practical part of the task was divided over four lessons. In the first, we practised a varied use of line and in later lessons, went to experiment with and compare different media, talked about tints, tones and shades, found out how to give an impression of movement through line and colour and how to apply a watercolour wash for the sky. At the end of each session, pupils evaluate their own work and that of their peers and identify difficulties with which we can deal at the beginning of the next lesson. I would never ask a pupil to copy a work of art. No artist can properly reproduce the work of another. It is one of the magical elements of creative work that every mark speaks not only of the artist’s skills but of their experiences, the way in which they hold the brush or the pencil, the light conditions on the day. To ask a pupil to copy is to set them up for failure, quite apart from the fact that it is impracticable to carve intricate woodblocks in a KS2 lesson or even to use oil paint. However, we can learn by looking at and reproducing small details of a painting in the way that music students will start to learn composition by reharmonising Bach chorales before going onto produce original work of their own. What is important is that the resulting work is evaluated in its own right rather than judged by how closely it resembles the original inspiration. In a typical unit of work at our school, the pupil will have a copy of the painting that we are studying before them. They will analyse and comment on it before making a line drawing or reproducing certain elements in which they are interested. They will then use these sketches in producing something of their own. In some units, the finished pieces bear an obvious resemblance to the original. The Year 3/4s’ Hokusai pictures are easily identifiable though some have pink skies, not all have boats and there is a range of media used. The children were tasked to produce a painting that suggested the movement of a wave through the use of line and colour and in this, they have, almost entirely, been successful. In contrast, in a unit on Gustav Klimt’s Tree of Life, pupils were asked to produce a symbolic picture representing a person or event in their own lives. Not one of the finished works looked anything like Klimt’s Tree but all the children were able to describe, often very movingly, how the elements in their work represented a lost relative or a joyous or sad occasion in their life. The understanding of symbolism that they gained in these lessons would equip them to decipher momento mori paintings of the 17th Century or Picasso’s Goat’s Skull, Bottle and Candleas well as to recognise other paintings by Klimt. In art, there are wonderful stories to be told. Story-telling has a place not only in recounting colourful, although sometimes apocryphal, details of an artist’s life but in the understanding of artistic subjects, whether explicit or implied. Paintings are objects created in a historical context by a specific individual and there is much to be learned from a careful consideration of the subject matter and of the thought processes and experiences behind them. Perhaps most fruitful are the stories that link artistic styles: van Gogh was entranced by the fresh colours and lines of Japanese prints; Mondrian’s early works show a clear familial resemblance to van Gogh’s later paintings; his style underwent a dramatic transformation when he came across the works of Picasso and the geometric style for his Mondrian is now known influenced, in its turn, the abstract art of the 40s and 50s. The dates of artists’ births, deaths and years of production may well seem dry but provide the underlying structure for these fascinating stylistic developments over time and across continents. It is the stories that the bare facts underpin that enable a Year 2 child to identify and discuss a painting by Rousseau and thereby to impress his or her headteacher or anyone else lucky enough to be conversing with them. I would not want to give the impression that all of the lessons at Willingham are based on a specific painting. There are units centred on the art and sculpture of the period that the children are studying in history. They design and make Christmas cards, which are printed for sale to their families, participate in the village Advent Window Scheme, take part in competitions and an art exchange with our twinned town in France and have opportunities to do observational drawing and independent creative work. Nonetheless, the units based on specific paintings and artists lie at the heart of our curriculum and provide a structure into which the other elements are linked. My experience thus far has convinced me that there need be no opposition between the teaching of art history and the acquisition and development of creative skills and I know that both can be a joyful and life-enhancing experience. We are still very much at the stage of evaluating, modifying and refining what we do but are happy to share thoughts and ideas with other schools at a similar stage in the journey.